Have you had the pleasure of working with Artesprix sublimation markers yet? I’ve been working with the set that came in the March kit to create shirts, hats, and book covers. 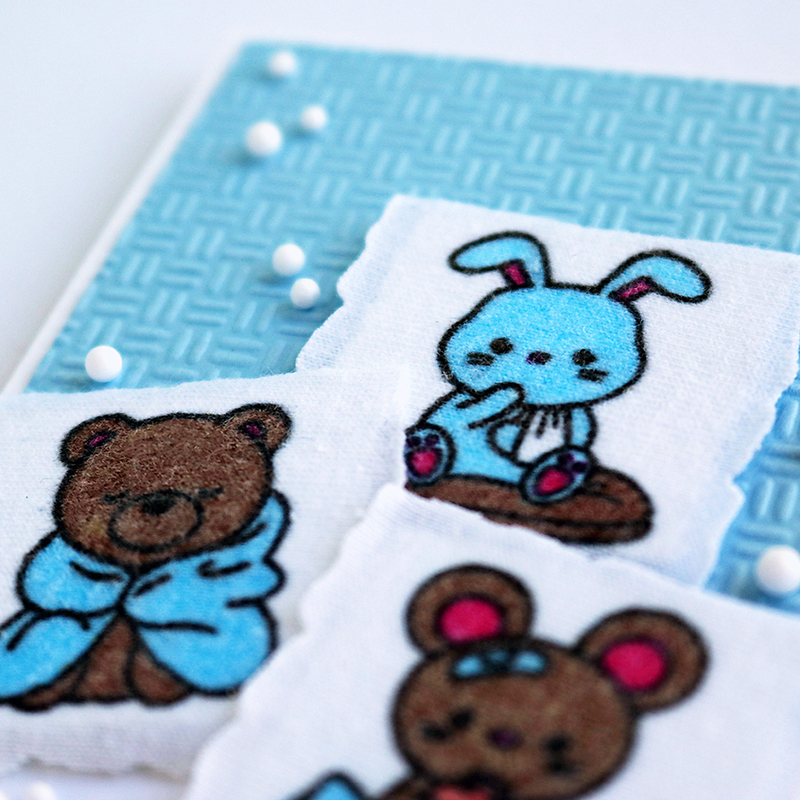 Today, I decided to make and share fabric card embellishments! There were some polyester blend scraps in my fabric stash, so that’s what I used for the transfer. 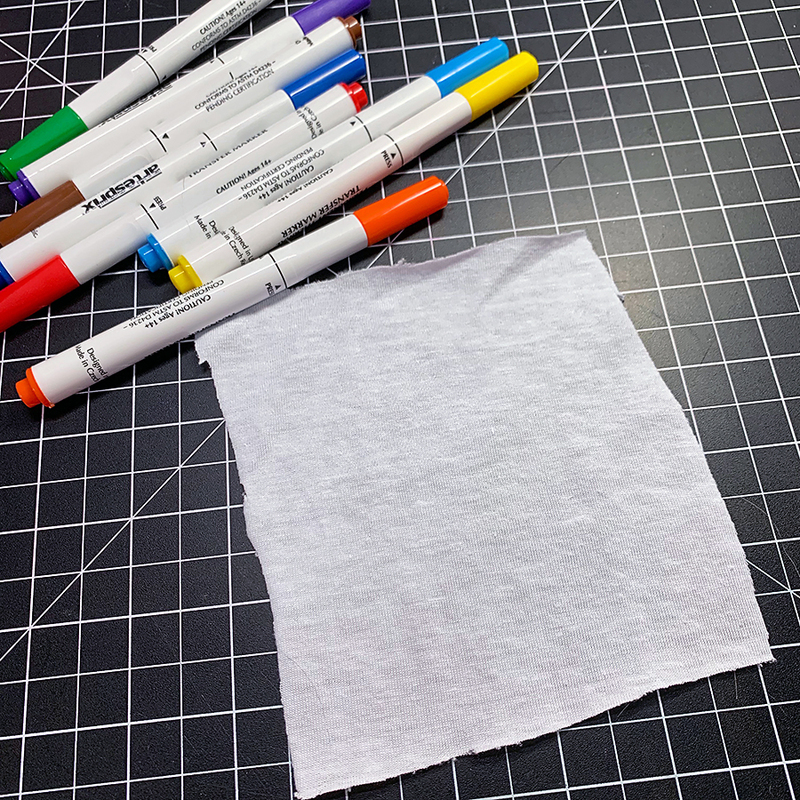 Artesprix markers work best on polyester, but you can use them on other fabrics – know they will come out a little more “vintage” than crisp and bright. 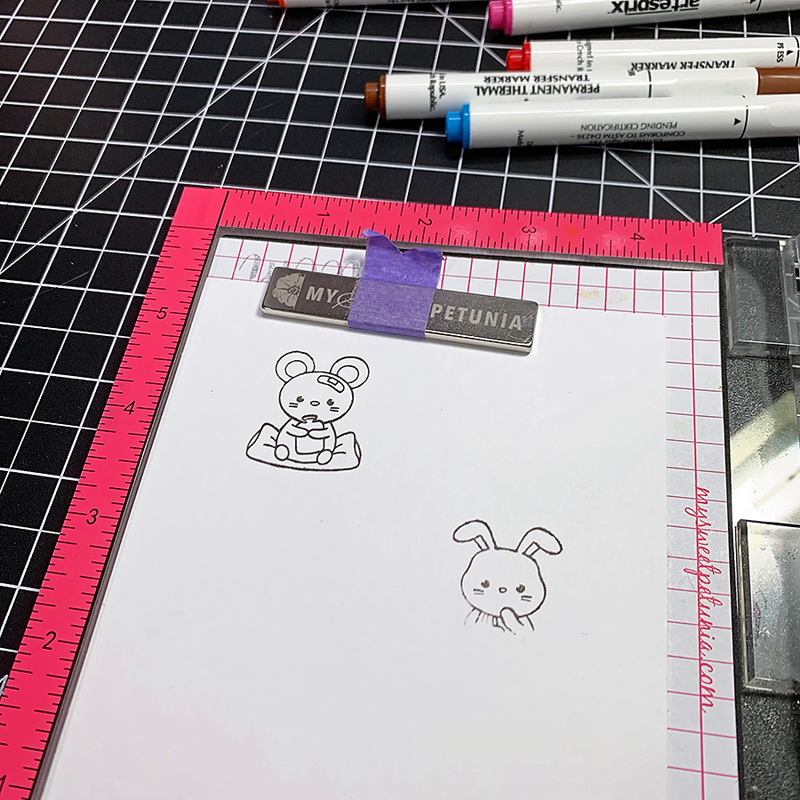 To start, I stamped my critters onto some 65lb cardstock by coloring in small parts of the stamps and stamping several times to get the whole image. The marker ink dries quickly, so you need to work fast. 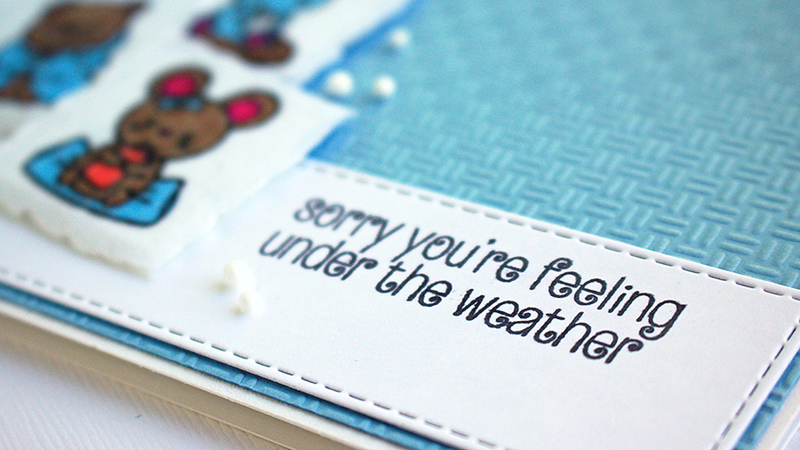 This set is called Under The Weather by Clearly Besotted. It’s rather hard to find nowadays, but you can use any cute stamps set you already own. Once I had my three little critters stamped, I colored them in by using a stippling technique. I tried to color normally, but I found I was smudging the super small details. Filling in the areas with lots of dots was much easier. 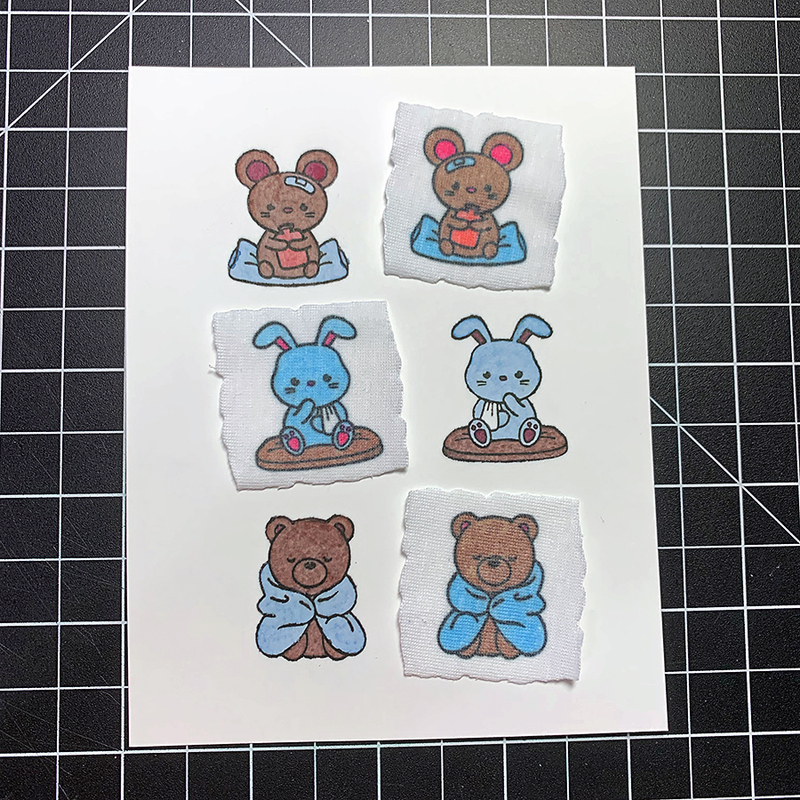 I waited for the ink to dry so to make sure I had the coloring even, then transferred the critters to the fabric square using a Cricut EasyPress (360F for 90 sec). Next, I punched three 1.25-inch squares and ran them through a Xyron sticker maker to cover them with adhesive. Then, I added them to the back of the fabric critters for a little stability. In keeping with the soft & comfy theme of my card, I chose a soft blue cardstock for the background and embossed it with a Provocraft embossing folder called Oxford. Then, I trimmed up the edges to 4 1/8 x 5 3/8-inches. 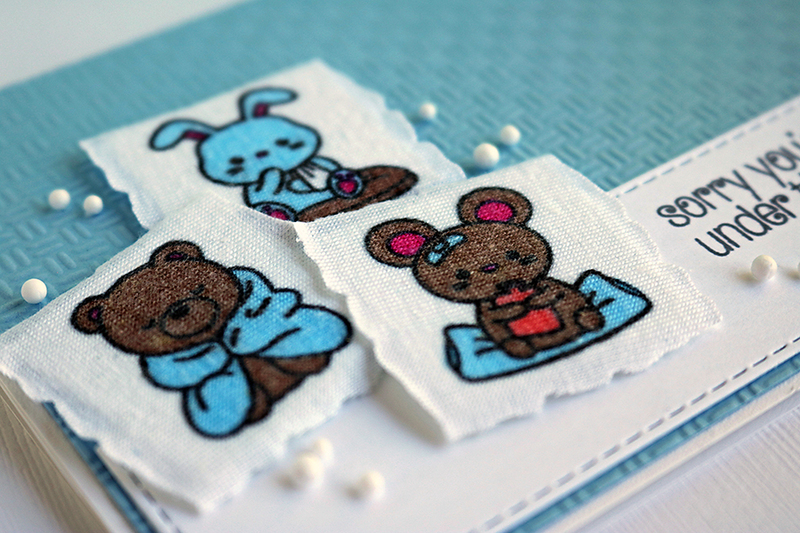 For the white sentiment strip, I used a Vertical Stitched Strips Die from My Favorite Things. This one is hard to find too, but there are tons of stitched dies available that you can use in place of it. Then, I stamped the sentiment using MidTone Shadow Ink in Charcoal. 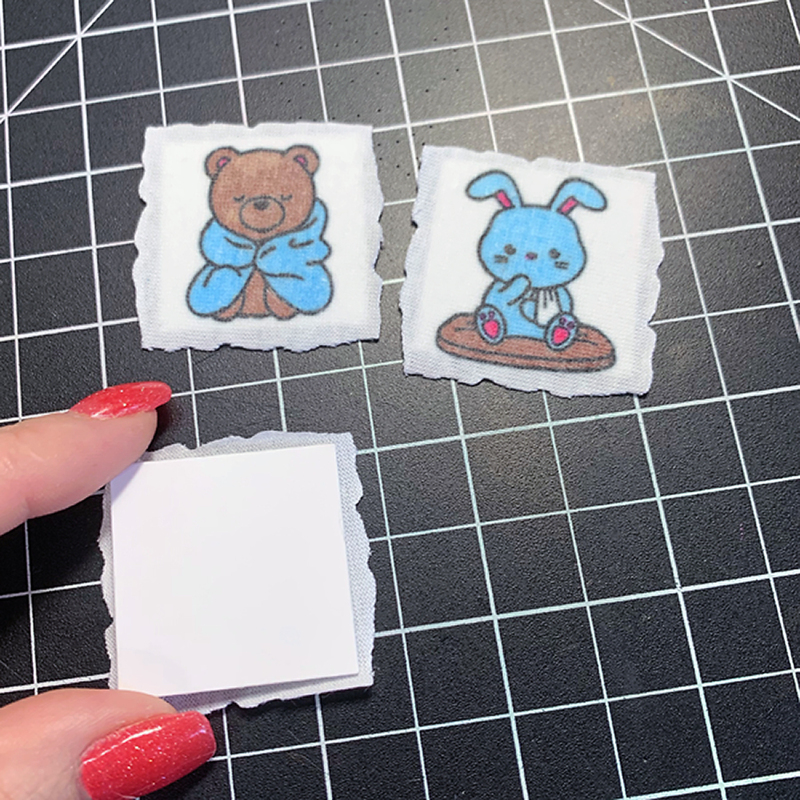 To put everything together, I layered the white piece over the lower part of the blue embossed panel with a lick of Tombow Xtreme glue tape, then arranged my little pillow critters and attached them with foam adhesive. Aren’t they cute?! Once I had my card front adhered to the card base, I felt like I needed to add sequins or something. But, they would be too shiny for this snuggly card. So, I rummaged through my embellishments and found these tiny snowballs in a shaker filler jar. Cotton balls. Perfect! I popped them in place with a few dabs of Deluxe Adhesive. Thank you for stopping in today! 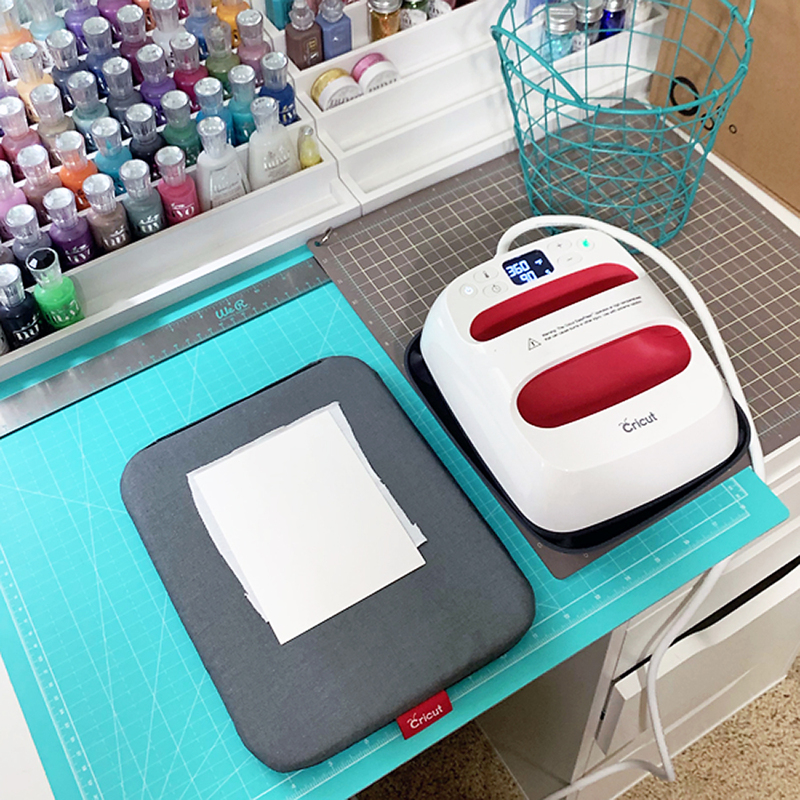 I hope this project inspired you to try your hand at some fabric card embellishments with Artesprix markers. Until next time!